It seems I owe you an apology. I’ve been absent. I could offer the frantic bustle of the holiday season as my defense, but that’s not really it. Honestly…I didn’t realize I had let the blog lapse. I’ve been conscientiously working to improve my presence on social media in general (primarily through Twitter and Facebook), and I’ve been trying to keep our supporters posted through KickStarter. All that has felt like an awful lot of updating, and I only just noticed that my last post here was pre-Christmas. If I’m regularly posting on Tuesdays and Thursdays (which I still pretend I am), then that’s only a week I’ve missed. But what a week! As you well know, I spent the first half of the month desperately trying to finish up The Dragonswarm for its mid-December release. It went live the week before Christmas to an immediate position on Amazon’s bestseller list for all Science Fiction and Fantasy. I spent a heady few days tracking sales and trying really hard not to run any income projections. After all, this was probably just an initial burst of sales from people who’d been waiting desperately for the sequel since they finished Taming Fire, and it would burn itself out, right? Still, I was pretty excited. 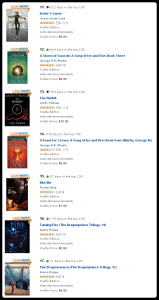 For a while there, I had two books in the top 100 for my genre. I woke up Christmas morning, checked my sales numbers, and realized I must have mis-remembered how many I’d had when I went to bed. Because there was no way I’d sold that many overnight. I went to church and came home to find hundreds more books had sold while I was singing “Silent Night.” Throughout the afternoon, while the family talked and snacked and played games, I just sat staring at my monitor and occasionally calling out numbers. They all had “hundred” in there somewhere. For most of the day, I was averaging 20 sales per hour of The Dragonswarm. That’s…well, that’s very good. But it was pretty thrilling to see it happen. That means the success of the sequel is much less likely to be a big spike that quickly drops off. It’s much more likely to have staying power. That said, Christmas day was a big spike. That was anticipated, too. It was a big spike across the industry, and by Monday morning there was already a significant decline. That decline will continue for several weeks, probably, until it settles at a new plateau (which will still almost certainly be higher than anyone’s pre-Christmas numbers). But now it’s been more than a week since Christmas, and our sales are still holding strong around 15 sales/hour for both titles. As you can see in the image above, Taming Fire and The Dragonswarm have been keeping each other company on the front page of the Science Fiction and Fantasy list (nervously avoiding eye contact with all the clones of George R. R. Martin). Amazon sold four million Kindles in December. Apple’s probably about to open up a much simpler (and, with any luck, a much more effective) indie publishing platform for iBooks. Consortium Books is planning to triple our existing library this year, and we’ve got some big exciting projects even apart from that. 2012 is going to be amazing. Stay tuned. This was written by Aaron Pogue. Posted on Tuesday, January 3, 2012, at 11:24 am. Filed under For Fun. Tagged Amazon, Consortium Books, Fantasy, George R. R. Martin, Kindle Publishing, Platform and Promotion, Publication, Science Fiction, Taming Fire, The Dragonswarm. Bookmark the permalink. Follow comments here with the RSS feed. Both comments and trackbacks are currently closed. That is GREAT! Congratulations — how very exciting! Thanks, Cynthia! And I really have to say I owe a lot to the writing program at OU. Most of this success is built on a novel I wrote ten years before I ever enrolled there…but most of the work I put into rewriting those novels was directly driven by the structural and pacing directions I learned from Deborah Chester. I should probably make a blog post on that point sometime soon. It’s been awesome watching you bring all this to fruition, Aaron. Dave, I can’t tell you how much I appreciate your enthusiasm over my successes now, and your encouragement back when I was nothing but a promise. Oh, sure, I knew I was destined for greatness, but hearing that others certainly made it a lot easier to put in the long hours and hard work. I’m very excited for you and even more jealous. Your success makes me so eager to just get a book out there. We’ll make it happen, Becca. No worries, there. Wow – how exciting for you and for those of us who have self-publishing dreams. This is an extraordinary time to be a writer. I’m thrilled to be finding this success without needing the help of some oppressive contract with a gatekeeping publishing company…but I’m also very aware that the opportunity arises far more from recent technological and social changes than it does from any special abilities of mine. I’m just glad to be in the right place at the right time. We all should be.